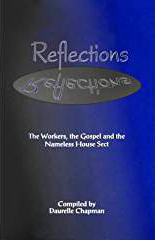 John Long wrote in the introduction to his Journal: The poetry found in this book is mostly my own composition, and are scattered throughout the pages to make it interesting, also to serve as a definition of subjects. FEBRUARY 1896 : During that month, I visited Gort and Athenry, where I met with dangerous persecution being denounced by the priests from off the altar for selling the Scriptures. I had to leave Athenry and go to Tuam being routed by the priest. "But when they persecute you in one city, flee ye into another," Matthew 10:23. They did not meddle with me in Tuam, though they would not buy from me. OCTOBER 1896: Every person should judge what they read and see that it is sound in the faith, for many corrupt books have gone out into the world. MAY 1897: During the days spent in that work I had many tiresome journeys; sometimes I walked twenty miles a day. Feeling the need of a rest, I went to Limerick city where the journeys were not so long. While there I underwent a severe trial for lack of money; during the delay I spent a day in prayer and fasting, and I received a very definite anointing of the Holy Spirit, and some money came in next day by post. NOVEMBER 1897: I removed from Birr to Roscrea and saw some of the results and fruits of the Revival. About the same time William Irvine had returned to Nenagh and had a mission in the Presbyterian Church given to him by Pastor Douglas. Some new persons decided for Christ, and some old believers were stirred up, also the young converts of the former mission were helped much, they were children who talked and walked for Jesus, and the whole town was in a ferment of Revival Element. 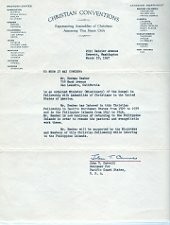 MAY 1900: Desiring to consecrate my life forever to God, as an act of ordinance and sanctification with the burial and resurrection of our Lord Jesus Christ, I got baptized by immersion, believing it to be a personal act, with personal responsibility; also leaving others to the liberty of their own conscience. I believe that adult immersion, once after conversion to be the original and Scriptural mood of the ordinance; but I am not to press or trouble the conscience of others who through different upbringing see differently, “For God hath received them,” Rom 14:3. Disputing about the time and mood of an ordinance is not well pleasing to God; and Christians should endeavor to keep the unity of the Spirit in the bond of peace; therefore, I do not make the mood and time of the ordinance a bone of contention and a bar to fellowship. I believe with good old John Bunyon that differences of judgment about water baptism should be no bar to Christian fellowship. I do believe in encouraging and instructing all who are seeking light and help, and who are disposed to obey according to the Scriptures. Our hearts are cleansed with blood. And tasted of His grace. Because the soul is saved. MAY 1901: We pitched our tent in St. Ninions for one week; but seeing no prospects of a successful mission, we again removed our tent to Kippen;where we had a good attendance, and God blessed the Word. And do as Paul would do. The word of Life declare. When they His truth receive. OCTOBER 1902: The different forms of church government in the world should not hinder Christians of worshipping God where there is prayer, praise and preaching, and the Word of God read in purity. No one man ministry should usurp the liberty of the Spirit. 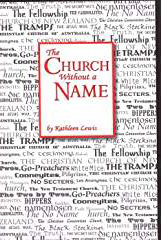 Would Jesus or his Apostles, or their most Scriptural representatives be permitted to preach in one out of a thousand churches, in certain countries, unless they were strictly conformed to their external ecclesiastical customs? For even then, unless their doctrines were according to the tastes of the managers and of the times. Even in the Jewish Synagogues, there was liberty; to speak, read, and pray; that is lacking in the so called churches of today. “Now therefore, ye are no more strangers and foreigners, but fellow citizens with the saints, and of the household of God,” Eph. 2:19. He had no settled home. Where He chanced to roam. As in days of Auld Langs Syne. To lay his weary head. While here on earth He trod. And yet the Son of God. For us He bowed His Head. Many persons thought that when I left the Go-Preachers, I would give up the work; or give up portions of the truth; but praise the Lord, all that I held then which was scripturally right, I still hold fast; and this year of grace 1923 finds me still preaching the Gospel, and fully in the Lord’s work and a Go-Preacher, though not in fellowship with them (Nov., 1941). Revealing the will of my Saviour and Lord. But publish it far with a zeal that is bold. There’s pardon in Jesus for them to be sure. Shall find full salvation and peace with the Lord. Go ye forth to meet Him. For Jesus they would dare to live and die. SEPTEMBER 1908: We had heard that the gift of tongues and interpretation of tongues given to the saints at Los Angeles, and to the Church of England in Sunderland, and to the Church of God in the West Port Hall, Kilsyth; was also given to a few Christians at Lytham. So Thomas Myrescough and I purposed to turn aside and see and hear and judge this wonderful manifestation for ourselves; without partiality or prejudice, by the Word of God and by the fruits. There we saw and heard for the first time persons pray, and speak in other tongues, as the Spirit gave them utterance. We judged it to be of God, because it stood the test of all the essential requirements of the New Testament: 1 John 4:1, 1 Cor. 12:1-3. They confess that Jesus Christ is come in the flesh, 1 John 4:2,3. They trust in and make much of the Precious Blood of Jesus. They are a praying people; also a praising people; a believing people, a missionary people; and a hospitable people. With all these marks and fruits there is much to praise God for and nothing to be afraid of. God is restoring the extraordinary gifts to the church before the second coming of our Lord. In remembrance of those days I wrote the following piece of poetry, which is no exaggeration, for it can be said as was expressed by the Queen of Sheba, "The half hath not been told." 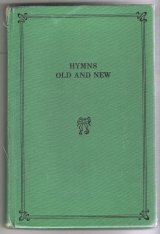 SEPTEMBER 1908: While we laboured in Preston, Thomas Myrescough was asked over to Yorkshire by a Baptist Pastor, to have a mission, and there was quite a little revival there through singing the following hymn; most of which I composed myself; on hearing the first words sung as a chorus, I added the rest. On his return from that mission, the Pastor wrote to him saying the over Jordanites were still singing that hymn! And telling what Christ did for me. No longer the manna on old corn I'm fed. And visions of Jesus did see. When I the dear Saviour shall see. And heaven my dwelling shall be. MARCH 1910. On the 17th I cycled to Dublin. It was Patrick's day; and I met with crowds of Romans wearing the Shamrock in remembrance of the venerable apostle of Ireland. I stopped a man and asked him the question. "How is it that Patrick used the Scriptures so much as to quote often from its sacred pages, and ye who profess to love him so much so as to wear the Shamrock but not one of you carry a Bible in your hands?" He answered, "The people are so ignorant, they do it because it is a custom, on the 17th of March." I said, "That's true indeed." By the saints of Patrick's age. By the priests and men of Rome. Time to work will soon be gone. In the Bible to suffice. Give herself to Jesus Christ. Finding that God’s will was best. Taken captive as a slave. God the call to Patrick gave. No distress could rob his joy. There he gave himself to prayer. And Gods will his great delight. Prayer with tears did then prevail. Written from the genuine works of St. Patrick. When they saw their son again. And his absence gave them pain. Dawn, before the Day light sun. Stood a man named Victicus. Come and help us, come you must. In our lovely Emerald Isle. In its pure and Holy Style. On that welcome Patrick’s Day. SEPTEMBER 1910: I have mentioned before the evil done by unjust judges, envy, jealousy, and an evil report; also the good done by bringing righteous judgment, love, kindness, well wish, and good report: the one is punished and the other is rewarded. Were bearing the fruits of the land. Were only two found in the land. And bringing a good report. A leper who sought to be clean. The man was converted I ween. In Solomon's days to inspect. She was numbered among the elect. And told her of the living stream. She said, is not this the Messiah? Who came the whole world to Redeem. The Gospel of God did receive. When he from his heart did believe. Who go forth in our Saviour’s name. They whom the Gospel proclaim. The gifts to His church once again. In showers, fresh, the best latter rain. What shall all the nations do. Over Him they never knew. For His choice and Holy Bride. Showed the love of Jesus who died to save from sin. The greatness of His Name. Showed the love of Jesus, who died to set us free. The honour of His Name. Showed the love of Jesus, who said to take and eat. I was an hungered and ye gave me meat. JANUARY 1912: Very few attended the mission although we visited many homes; yet the crowds of people flocking to picture palaces were lamentative. One day as I was passing a picture palace, and beholding a crowd of people many pearches long waiting for the doors to be opened, I felt like alighting, and proclaiming a great war on awful calamity coming as a judgment on the people because they had forsaken the Word of the Lord for frivolity and worldly pleasures: yet there is repentance for them all if they will turn at His reproof. Let us then His praises sing. With our Bible by our side. For His children will provide. Working while it’s called to day. Taking time to watch and pray. Till' our Lord returns again. And give thee all things good. At night upon thy bed. AUGUST 1912: Leaving the south of Ireland, I cycled to Dublin, and crossed to Liverpool to Harry Sherratt's camp conference, held that year near Leyland. It was a trying experience sleeping under canvas during thunder and lightning and heavy rain. Yet, the name of the Lord was a strong tower; the shadow of a great rock in a weary land. Then we need not faint nor sigh. For we know the Father's voice. This is why we should rejoice. That, Jesus died for me. Then let me to him flee. And try to do your best. Have plenty in their crib. Must of the Gospel live. And teach us of God's grace. And in His cross alone. To get our noblest praise. When we our sins confessed. And loved us to the end. They in his love confide. One body and one bride. The Lord to be my God. And spread His fame abroad. I on His death depend. A life that knows no end. Shall never taste of death. May end our mortal breath. Or it must be the breaking of the day. "When we don't judge ourselves, every transgression, and disobedience receives a just reward." Was spent like a tale that was told. It will never, no never grow old. Bestowing his grace with the rod. To bring the poor sinner to God. And blot from His book every stain. For Jesus our Saviour and friend. Lord help us to value each moment. We cannot tell when they shall end. The darkness still cover the land. Were restored with His love. Christ is the way to God. Through faith in Jesus name. The air, the earth, the sky. Our Great High priest and King. Let all His people sing. To all who plead the Blood. We hear the midnight cry. That Christ, our Lord is nigh. But call them to repent. For this His Son was sent. To save them by His grace. And try to set them free. Preach Christ throughout the Land. To heal the sick and faint. For what His grace has done. Thou didst my soul to thee restore. Through Jesus Christ the Son..
And then I must prevail. Shall nothing by it gain. When on the Lord we call. No other name for me. SEPTEMBER 1922: On the 15th I reached the 50th year of my age alive and in good health. Praise the Lord! The Levites began their service at 25 and completed their active service at 50. Lev. 8:24. From that time they were to minister as elders; but not in active service. The younger was to serve the elder. 1 Peter 5:5. The Evangelist or Pastor, who reaches that age without the reproach of Christ, in being despised and rejected; has not been faithful in all his house. 2 Tim. 4:16. Thy word doth guide and cheer. Thou hast my life preserved. I still the good news tell. 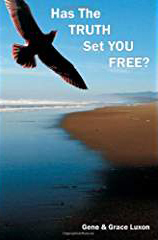 Rejoiced to be set free. As elder had a part. JULY 1923: Because I believe in all the Scriptural gifts and truths some Christians put me down as being in error. We must not marvel at this; but be content to bear the reproach of Christ patiently: it is one of the wounds whereby we’re wounded in the house of our friends. To correct the wrong opinions of others would take all our time; and I am afraid nothing accomplished in the end; however, we must go on with truth for the word of God lives, and the testimony of receivers confounds them. Let not your alms be known. Who reigns upon the throne. As unto Christ our Lord. Shall get a full reward. That when ye bow the knee. He shall thy burden share. Despise no Child of God. What grace He gives to such. God’s Word let it suffice. Of a true love for Christ. Bear His reproach and cross. And count all things but dross. Whom men should serve and fear. It is a precious book. And sealed by Jesus Blood. The truth itself makes free. I’ll read it day by day. It teaches me to pray. On earth, yet here am blessed. MARCH 1923: The following piece of poetry is the natural product of my experience during the last two years, so often expressed. Part of the chorus are words I remember reading out of the Christian Herald, about thirty years ago. Whom Christ our Lord sets free. We’re all for Christ the King. And some His love proclaim. We joy in His great name. It is our Lord who died. For it we need to pray. Ye people great and small. And put their sin away. To Christ the risen Lord. And wash in Jesus Blood. AUGUST 1924: The following lines were written in remembrance of the Easter convention in Preston. Trust in His merit: “Only believe”. Come back to Jesus, “Only believe”. Hear Him proclaiming, “Only believe”. Jesus is with you, “Only believe”. AUGUST 1924: During that thirty years of service in our Lord's work. . .
And grant a rich blessing so free. The bow in the clouds is a sign. Till a crown and mansion are won. And give me a blessing this day. AUGUST 1924: we have learned by experience to avoid rash judgment and sharp controversy; such does no good, and tends to separate friends: to wear the ornament of a meek and quiet Spirit is the best badge, and happy are those when reproach never gets cross, or lose their temper. For present help and aid. My child, be not afraid. And it is meant for all. Content with what I’ve got. God will direct my path. SEPTEMBER 15, 1925: On the fifteenth I reached my fifty third birthday, in good health stronger than ever before only I have fewer teeth. Ranks equal with them all. Or from the current news. Or for the present time. For every sect and creed. And to His Word keep true. Live on the victory side. It says, “Be of good cheer”! The following piece of poetry came to me while on an open air tour in South riding Tipperary, during the summer of 1912. Look for the rising sun. And brought back to the fold. We hear the people sigh. Will hearken to their cry. Watered with tears and prayer. How true it is and good. DECEMBER 1926: The following piece of poetry has been published in this month’s copy of “Bright Words”. When they His Word receive. My Father himself keeps the store. And I'll not be poor any more. While Jesus they praise and adore. And I'll wander away no more. For the good I will do. And work in Gods vineyard to day. Content with a labourer’s pay. There were eight children born into his family: Eliza Jane-1868; Maria–1870; John-1872- 1962; William–1874; Anne Ellen-1876-77 (lived 9 months); Samuel–1879; Anne Ellen-1881; and Thomas-1883. John & Margaret (Keegan) Long had 4 children: Miriam, born March 1, 1923. Gilbert, born January, 1927; Rhoda, born May, 1929; and John born March 15, 1931. JULY 1916: The following piece of poetry was written to express my feelings on returning home after the occasion of my Mother’s death. At midnight on the 16th April, 1916, my mother fell asleep in Jesus; followed by her son Thomas on the 17th April...We buried them both in my Grandfathers grave, William Turner, in Ballingarry Churchyard. My mother was a good religious woman who gave testimony unto the saving power of Jesus Christ. My Brother Thomas Long was a quiet man, who was deeply and deservedly regretted, and missed the trouble that followed after, owing to the Sinn Fien, rising in the district, showed that they both were taken from the evil to come when they were best fit. On the 2nd of May, 1916, my sister Maria died and was buried in Glenmore churchyard. While here on earth I roam. I like to visit home. His words I still retain. I see the old arm chair. For mother is not there. By us is heard no more. Was kind, and true and good. Her soul is gone to God. We would not wish them here. If Christ I love and fear. MARCH 1923: On the 1st of March, 1923, God blessed us with the birth of a little baby girl; which we welcome as a gift from Him; and a seal on the married life. The cradle and the pram. And Miriam is her name. Till parting days are o’er. Forbid them not, He said. And triumphed o’er the dead. On March 8 – we dedicated Miriam unto the Lord, by a worthy elder James Gault, in prayer. My grace, mercy and peace attend you all the days of your life. Honour thy Father and Mother; which is the first commandment with promise. Eph. 6:2. Now my child it is our desire and prayers that as you grow up into adult years: that you should personally accept the Lord Jesus as your Saviour; confess Him with your mouth before men. Rom. 10:9,10; and keep His commandments. John 14:15. See to it that you get baptized by immersion, at your own request. Acts 2:41. See to it that you remember our Lord’s death in the ordinance of the Lord’s supper. Luke 22:19. Live for the Kingdom of God. Always believe in the Divinity of our Lord Jesus Christ; and in the merits of His precious Blood. Meet your parents in heaven. The Lord will keep you and provide for you; only live and work for Him. Remember all God’s promises are yours through faith. Always pray, and daily read the Bible. 1927 JANUARY: On January the first, New Years day, God blessed us with the birth of a baby boy; and so in His own mysterious way fulfilled one of the greatest promises ever given to me in the fifty fifth (55) year of my age, namely, “I will visit you, and perform my good word towards you.” Jer. 29:10; though I had to wait twenty-six years for it. On the Hill near Knookanacree, Cloughjordan, lived one of my ancestors named Gilbert Carter, my Grandmother's father, whose son was Thomas Carter a worthy Methodist local preacher. My father's name was Gilbert Long, Burntwood, Cloughjordan, County Tipperary. In order to revive the name of my forefathers, I will call my son’s name Gilbert Long and give God the glory for His mercy, love, and Grace in bestowing this favour upon an unworthy servant of His. “And thou shalt remember all the way which the Lord thy God led thee.” Deu. 8:2. On the eighth day we presented the child unto the Lord to be an Evangelist, by the hands and prayers of Elder James Gault and Pastor Mercier; the word occurs in Luke 2:21-22. The example in Matt. 19:13, also the commendation of our Lord, Mark 10:13, 14, and the teaching of the apostles, Eph. 6:4. We cannot find command or example for infant baptism in the New Testament, we can for infant dedication; and if this had been properly taught in the past it might have saved the church from much serious dispute. To Gilbert Long, my beloved son. It is your parents wish that you grow up to accept, and serve God; also that you obey, and confess our Lord Jesus Christ; it is our wish and desire that you should be an Evangelist, and give your life fully to the Lord’s work. As soon as you come to adult age; and knowledge of Salvation through faith in Jesus, get baptized by immersion; also break bread in remembrance of our Saviour’s death on the cross; and look for the second advent of our Lord. Preach the Gospel to every creature; and have fellowship with all believers in the Holy Spirit; and continue the Evangel in which your father has laboured for thirty three years: and the end is not yet. Hallelujah! JANUARY 1902: About that time I heard that my Brother Samuel Long died in India. He was a soft tenderhearted youth who was converted under the ministry of William Irvine. He began to pray and confess Christ under the ministry of John Good. As a domestic servant, he met with some hard masters; not succeeding so well in that line of occupation, he enlisted in the Army and was sent out to China during the Boxer persecutions. On his removal to India, he died at Singapore on 25th Dec., 1901 after thirty two days sickness. The day I heard of his death, the text turned out to be, “And they that were ready went in with him to the marriage; and the door was shut,” Matt. 25:10. This news came as a sad trial to my dear mother, whose physical health was not able to bear much strain. Until we get to heaven. Out of the number seven. Before the end had come. To draw him unto God. Nothing can vex him there. But we can go to him. To live in bliss with him. Each other for to love. JULY 1924: My wife and Miriam, my daughter, had to go home, as her brother was in a hopeless condition of health. On Thursday 2, he, John Keegan, fell asleep in Jesus at the age of 26. Shall trouble us no more. Lord, have I done my best? Is while your passing through. And win a heavenly prize.